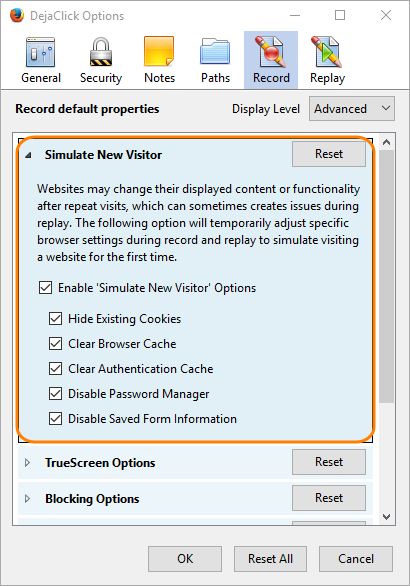 The Simulate New Visitor option acts as a master switch to enable a set of sub-options that control how the browser behaves when recording and replaying scripts. A successful replay of a particular web site requires duplicating a 'new visitor' experience. You are recording a Business Transaction for replay with AlertSite global monitoring platform. Learn more about monitoring Business Transactions with AlertSite. By selecting > Quick Settings > Simulate New Visitor. By selecting > DéjàClick Options > Record tab > Simulate New Visitor property group. You may enable or disable the Simulate New Visitor option (prior to recording) to suit your needs. The state of each associated sub-option will be saved as part of the script so that the browser settings can be temporarily reconfigured each time the script is replayed. Websites may change their displayed content or functionality after repeat visits, which can sometimes create issues during replay. This option temporarily hides your browser’s stored cookies to simulate visiting a website for the first time. After record or replay, your previous cookies are restored and any new cookies are automatically appended. Depending upon configuration, when a page is loaded its resources may be cached so they don't need to be downloaded after repeat visits. Some websites may change their displayed content or functionality after repeat visits based on whether certain images have been requested from the server. This can sometimes create issues during replay if you have cleared your browser's cache, are using a different computer, or if you are recording a Business Transaction for replay with AlertSite's global monitoring platform. This option clears the browser's cache prior to record or replay. Your browser remembers authenticated user sessions until restarted, and will automatically re-authenticate with the same servers after repeat visits. If you have previously authenticated, no login prompt will be displayed while recording the script. This may create issues during replay if you are using a different computer, or if you are recording a Business Transaction for replay with AlertSite's global monitoring platform. This option clears the browser's authentication cache prior to record or replay. Depending upon configuration, your browser may remember passwords you entered in web page forms and automatically preload them after repeat visits. This can sometimes create issues during replay if you have cleared your password data, are using a different computer, or if you are recording a Business Transaction for replay with AlertSite's global monitoring platform. This option temporarily disables the browser’s auto-fill behavior for form password fields during record and replay. Depending upon configuration, your browser may remember data you entered in web page forms and automatically preload those values after repeat visits. This can sometimes create issues during replay if you have cleared your private data, are using a different computer, or if you are recording a Business Transaction for replay with AlertSite's global monitoring platform. This option temporarily disables the browser’s auto-fill behavior for form input fields during record and replay. Select > DéjàClick Options from the toolbar. Switch to the Record tab of the DéjàClick Options dialog. Expand the Simulate New Visitor property group.